Say this prayer for the sick, suffering, and dying that God's mercy may intervene and save them. This prayer is from the 14th Century and commonly said after receiving Holy Communion. This prayer is one that has an indulgence attached. Today we recall the Martyrdom of St. John the Baptist, who was the one that baptized Christ and prepared His way by baptizing people in repentance. Specifically, today we recall his death. Devotion to St. John the Baptist has been widespread for centuries. At the time Herod the tetrarch heard of the reputation of Jesus and said to his servants, "This man is John the Baptist. He has been raised from the dead; that is why mighty powers are at work in him." Now Herod had arrested John, bound (him), and put him in prison on account of Herodias, the wife of his brother Philip, for John had said to him, "It is not lawful for you to have her." Although he wanted to kill him, he feared the people, for they regarded him as a prophet. But at a birthday celebration for Herod, the daughter of Herodias performed a dance before the guests and delighted Herod so much that he swore to give her whatever she might ask for. 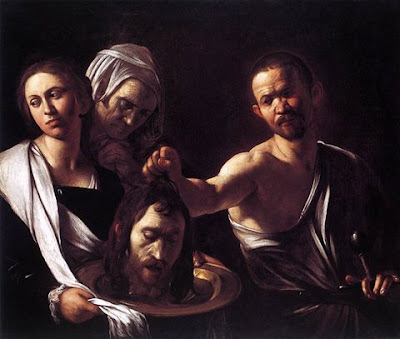 Prompted by her mother, she said, "Give me here on a platter the head of John the Baptist." The king was distressed, but because of his oaths and the guests who were present, he ordered that it be given, and he had John beheaded in the prison. Say a prayer for St. John the Baptist's intercession that he might lead us closer to Jesus Christ, Our Lord, and Master. And like St. John, may we be willing to stand true to the Faith and morality even if it means our own martyrdom. May the holy festival of Thy Forerunner and Martyr, St. John the Baptist, we beseech Thee, O Lord, afford us help unto salvation: Who livest and reignest. Gospel: Who do you say that I am, Peter? We heard those clear words in last Sunday's Gospel and then we see Peter, the first-pope-to-be, answering correctly: "We have come to believe that you are the Christ, the Son of the living God." This is the first proclamation of true faith in the Gospel; someone saw Jesus as more than a man but God. Jesus began to show his disciples that he must go to Jerusalem and suffer greatly from the elders, the chief priests, and the scribes,and be killed and on the third day be raised. Then Peter took Jesus aside and began to rebuke him,"God forbid, Lord! No such thing shall ever happen to you." He turned and said to Peter,"Get behind me, Satan! You are an obstacle to me. You are thinking not as God does, but as human beings do." Then Jesus said to his disciples,"Whoever wishes to come after me must deny himself, take up his cross, and follow me. For whoever wishes to save his life will lose it,but whoever loses his life for my sake will find it.What profit would there be for one to gain the whole world and forfeit his life? Or what can one give in exchange for his life? For the Son of Man will come with his angels in his Father's glory, and then he will repay all according to his conduct." This probably seems like a colossal misinterpretation of what Peter said. He only wanted the best for Our Lord, right? But then we see the truth in Peter's words. Remember that Jesus Christ was born for one purpose: to die. He was born to die on our Cross and shed His blood for our sins and go into the ground for three days and rise again. The entire purpose the Son of God (truly God Himself too) became flesh was to die for us; Peter right here thinks he is doing good but he is really tempting Christ like Satan tempted Him in the desert. The Cross was meant for us and Christ came to take it away so that all of our crosses might unite with His. The entire point of becoming man was to save us, and all of us too, from eternal death. It didn't matter if we would go to Mass every week, pray often, or even love Him...He died for us anyway. He died for every single soul in existence no matter how cruel that said soul was, so that he/she might be able to see His face and live in paradise. Now, Heaven still requires work - we must believe and follow the Commandments including attending Sunday Mass, etc. Jesus must be the foundation of our lives and we must love Him with all our heart, mind, and soul and love our neighbor as ourself. Every sin no matter how small is a wedge between us and God. Let us reflect on our lives and sincerely plan to go to Confession. Let us profess our belief that Jesus is God, but go further and show good works. Let us do as Peter did and say "You are the Christ, the Son of the living God" and add one important extention: "I love you." The most touching point of the homily today was when my priest asked: "So when did Peter finally figure everything out and follow Christ?" It happened right after Jesus was arrested. He was taken and beaten and interrogated and mocked while Peter sat outside. And there Peter denied Christ three times as Our Lord said would happen. And at that moment, Peter looked up and saw Christ and Christ saw Peter; their eyes met...and Peter wept for He knew the truth. The truth is that Jesus Christ died for him too. With the Year of the Eucharist drawing to a close very soon let us just sit before the Sacred Host for one moment, gaze into it with our heart and say: "Jesus Christ, I adore you." Here is my review of Crossing: Reclaiming the Landscape of Our Lives by Mark Barrett, OSB. I originally chose this book because it was supposed to deal with the Liturgy of the Hours, the Church's specific prayers of the day, and I wanted to learn more on the Liturgy. This book, though, took the general look at the Liturgy. I was looking for more of the common prayers and advice on praying the Liturgy of the Hours. In the book the author describes our days as full of crossroads through a garden (the garden being a metaphor of our life), and only if we rely on God and think clearly about how to improve our lives through prayer can we hope to travel through life without going in circles. Make sure you see prayer as a personal dialogue with God and an opportunity to reflect on our day so far. If you, however, do not rely on God then we are nothing and surely can not find our way through a garden because it would undoubtedly seem a wilderness. 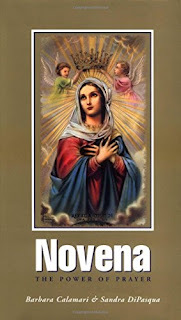 I just checked out a fabulous book called "Novena: The Power of Prayer" by Barbara Clamari and Sandra DiPasqua. It is composed of prayers in three sections: the saints, Marian novenas, and Novenas to God. Each section briefly describes the devotion/person and then lists the novena. It's a great necessity for any devout Catholic, and I would really like to buy one of these books soon. As we profess, the Eucharist is the Real presence of Jesus Christ: Body, Blood, soul, and divinity. Think about the wonder and joy in receiving the Word made flesh, the Light of the world. "Therefore whosoever shall eat this bread, or drink the chalice of the Lord unworthily, shall be guilty of the body and of the blood of the Lord. But let a man prove himself: and so let him eat of that bread, and drink of the chalice. " (1 Cor. 11:27–28). Let us show the Lord our love and seek Him out in the Holy Eucharist in adoration and praise; let us receive Him with a forgiven heart full of love for the Light of the World. "Whoever comes to me shall not walk in darkness but shall have the light of life." And, then let us go forth as tabernacles of the Highest and love all others. St. Rose of Lima (1586 - 1617), virgin, lived for Jesus Christ. She became the first canonized saint of the Western Hemisphere and was a Dominican lay tertiary, who worked to evangelize the Indians. Her parents wanted her to marry, but she wanted to remain single and dedicate her life to Christ. St. Rose not only prayed for hours each day but took care of orphans and the elderly that needed help. She lived each day for Jesus Christ and her friends included St. Martin de Porres and St. John Masias. In her life of penance, many people viewed her highly, and she was even a member of the Third Order of St. Dominic. At age five, St. Rose devoted her life to God and served Him through all of her trials. St. Rose was born to Spanish immigrants and was a beautiful girl. At a young age, she used pepper and lye to ruin her complexion so she would not be viewed as attractive to help her vow of chastity. She had a great devotion to St. Catherine of Siena. St. Rose wore roses around her head but underneath them was a crown of thorns - it was her penance. She was tortured physically by the devil and scolded by her family, but she thought of them as treating her better than she deserved. For fifteen years she suffered spiritually abandonment until her death when she received the companionship of Mary and her guardian angel. St. Rose of Lima even had the invisible stigmata. O Almighty God, the Giver of all good gifts, Who didst will that blessed Rose, bedewed with Thy heavenly graces, should blossom forth in the Indies as a lovely flower of virginity and patience: grant to us Thy servants so to run in the odor of her sweetness, that we may be found worthy to become a sweet savor of Christ: Who with Thee liveth and reigneth. Today was my first day back to a busy schedule of work and it may be very difficult to see God through everyday life. But He is there. He's in the small joys we see, the pleasant conversations, the joy of getting something done right. God isn't just that sensation but Our Lord and God, who watches out for us and loves us with an infinite love. He died for you, for me, for your neighbor and everyone else. Even when life gets down, always look up and know that God is there. He is always with us through the trials and joys, and we will all ultimately arrive at the gates of the small eternal city. And what will we say: I forgot to pray; I didn't know how. Just say, "Lord I love you. Have mercy on me. Look at what I have done and look at what I have failed at but know I love you." My apologizes if I am unable to post everyday, but thank you to everyone that will still come back here and hope to read something. 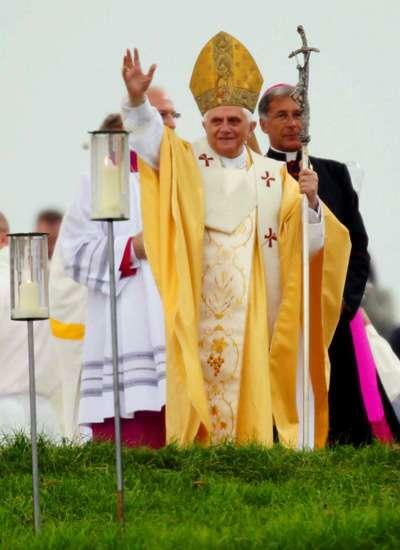 Well, World Youth Day is over and so is Pope Benedict XVI's first international trip. The next World Youth Day will be in 2008 in Sydney, Australia. Do you think Pope Benedict XVI passed the "test" of being able to connect with the youth? "It is a poverty to decide that a child must die so that you may live as you wish" (Mother Teresa). FDA approves Morning after pill! President Bush supports Plan B! Unborn children murdered for cosmetics! Bush vetos embryonic stem cell research bill YES! Pope Benedict XVI - "God loves every embryo"
Prop. 73 will be back! Why did Jesus Institute the Eucharist? The institution of the Eucharist was at the Last Supper, on the night before Our Lord's death, where He offered us the greatest gift of all - Himself in the Eucharist. 28 Q: Why did Jesus Christ institute the Most Holy Eucharist? 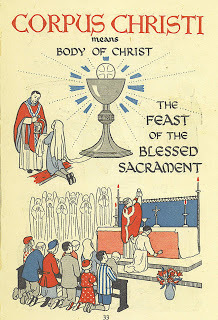 A: Jesus Christ instituted the Most Holy Eucharist for three principal reasons: (1) To be the Sacrifice of the New Law; (2) To be the food of our souls; (3) To be a perpetual memorial of His passion and death and a precious pledge both of His love for us and of eternal life. As I watch now, Pope Benedict XVI is boarding his plane to leave Cologne, Germany from World Youth Day, and I reflect on the closing Mass today. 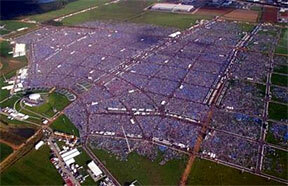 Over 1 million people from over 200 countries attended the Holy Mass in Marienfeld. The Pope encouraged the pilgrims to read the Catechism of the Catholic Church, but stated that "books alone are not enough. Form communities based on faith." Read his excellent homily via the Vatican's website. The next World Youth Day is scheduled for Sydney, Australia in 2008. With the release of Dan Brown’s “The DaVinci Code” coming to the big screen, a 61-year-old nun protested outside of the cathedral where it was filmed in London for 12 hours by praying the Rosary on the concrete in reparation for the lies of the movie against Jesus. Many view this book offensive because it states lies about Christ and the Church including that Jesus was married to Mary Magdalene, had a child with her, and she started the papacy. Some claim this is fiction and is no harm, but while I watched the program many people talked about how they believe it as the truth! I’m certainly opposed to a movie like this that distorts the truth, and the Only Truth at that, just to make money. August 2006 Update: Visit Jesus Decoded and my later post on this. I'm writing this post after the WYD celebrations have concluded but as I put these posts in the archives of my blog I felt that the WYD section would not be complete without Eucharistic Adoration mentioned. On August 20, 2005, many, many people remained in an all-night Eucharistic Adoration Vigil to adore Our Lord who is truly present (Body, Blood, Soul, and Divinity) in the Eucharist. Eucharistic adoration is indeed a great gift and my favorite form of prayer. 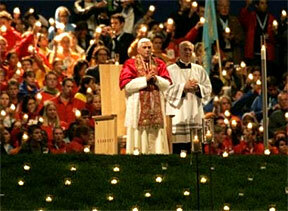 Christ-Haunted posted that beautiful photo above of Pope Benedict XVI during Adoration. In our pilgrimage with the mysterious Magi from the East, we have arrived at the moment which St Matthew describes in his Gospel with these words: "Going into the house (over which the star had halted), they saw the child with Mary his mother, and they fell down and worshipped him" (Mt 2: 11). Outwardly, their journey was now over. They had reached their goal. But at this point a new journey began for them, an inner pilgrimage which changed their whole lives. Their mental picture of the infant King they were expecting to find must have been very different. They had stopped at Jerusalem specifically in order to ask the King who lived there for news of the promised King who had been born. They knew that the world was in disorder, and for that reason their hearts were troubled. They were sure that God existed and that he was a just and gentle God. And perhaps they also knew of the great prophecies of Israel foretelling a King who would be intimately united with God, a King who would restore order to the world, acting for God and in his Name. It was in order to seek this King that they had set off on their journey: deep within themselves they felt prompted to go in search of the true justice that can only come from God, and they wanted to serve this King, to fall prostrate at his feet and so play their part in the renewal of the world. They were among those "who hunger and thirst for justice" (Mt 5: 6). This hunger and thirst had spurred them on in their pilgrimage - they had become pilgrims in search of the justice that they expected from God, intending to devote themselves to its service. Even if those who had stayed at home may have considered them Utopian dreamers, they were actually people with their feet on the ground, and they knew that in order to change the world it is necessary to have power. Hence, they were hardly likely to seek the promised child anywhere but in the King's palace. Yet now they were bowing down before the child of poor people, and they soon came to realize that Herod, the King they had consulted, intended to use his power to lay a trap for him, forcing the family to flee into exile. The new King, to whom they now paid homage, was quite unlike what they were expecting. In this way they had to learn that God is not as we usually imagine him to be. This was where their inner journey began. It started at the very moment when they knelt down before this child and recognized him as the promised King. But they still had to assimilate these joyful gestures internally. They had to change their ideas about power, about God and about man, and in so doing, they also had to change themselves. Now they were able to see that God's power is not like that of the powerful of this world. God's ways are not as we imagine them or as we might wish them to be. God does not enter into competition with earthly powers in this world. He does not marshal his divisions alongside other divisions. 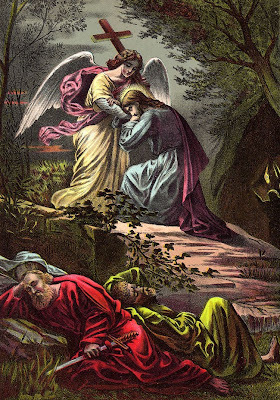 God did not send 12 legions of angels to assist Jesus in the Garden of Olives (cf. Mt 26: 53). He contrasts the noisy and ostentatious power of this world with the defenceless power of love, which succumbs to death on the Cross and dies ever anew throughout history; yet it is this same love which constitutes the new divine intervention that opposes injustice and ushers in the Kingdom of God. God is different - this is what they now come to realize. And it means that they themselves must now become different, they must learn God's ways. They had come to place themselves at the service of this King, to model their own kingship on his. That was the meaning of their act of homage, their adoration. Included in this were their gifts - gold, frankincense and myrrh - gifts offered to a King held to be divine. Adoration has a content and it involves giving. Through this act of adoration, these men from the East wished to recognize the child as their King and to place their own power and potential at his disposal, and in this they were certainly on the right path. By serving and following him, they wanted, together with him, to serve the cause of good and the cause of justice in the world. In this they were right. Now, though, they have to learn that this cannot be achieved simply through issuing commands from a throne on high. Now they have to learn to give themselves - no lesser gift would be sufficient for this King. Now they have to learn that their lives must be conformed to this divine way of exercising power, to God's own way of being. They must become men of truth, of justice, of goodness, of forgiveness, of mercy. They will no longer ask: how can this serve me? Instead, they will have to ask: How can I serve God's presence in the world? They must learn to lose their life and in this way to find it. Having left Jerusalem behind, they must not deviate from the path marked out by the true King, as they follow Jesus. Dear friends, what does all this mean for us? What we have just been saying about the nature of God being different, and about the way our lives must be shaped accordingly, sounds very fine, but remains rather vague and unfocused. That is why God has given us examples. The Magi from the East are just the first in a long procession of men and women who have constantly tried to gaze upon God's star in their lives, going in search of the God who has drawn close to us and shows us the way. It is the great multitude of the saints - both known and unknown - in whose lives the Lord has opened up the Gospel before us and turned over the pages; he has done this throughout history and he still does so today. In their lives, as if in a great picture-book, the riches of the Gospel are revealed. They are the shining path which God himself has traced throughout history and is still tracing today. My venerable Predecessor Pope John Paul II, who is with us at this moment, beatified and canonized a great many people from both the distant and the recent past. Through these individuals he wanted to show us how to be Christian: how to live life as it should be lived - according to God's way. The saints and the blesseds did not doggedly seek their own happiness, but simply wanted to give themselves, because the light of Christ had shone upon them. They show us the way to attain happiness, they show us how to be truly human. 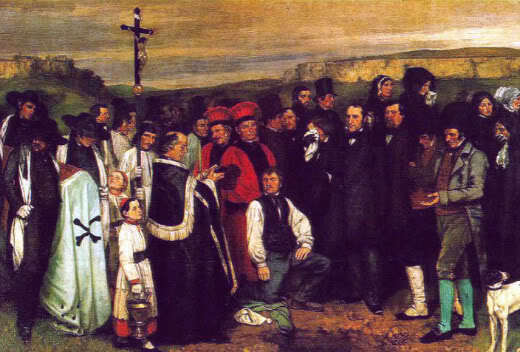 Through all the ups and downs of history, they were the true reformers who constantly rescued it from plunging into the valley of darkness; it was they who constantly shed upon it the light that was needed to make sense - even in the midst of suffering - of God's words spoken at the end of the work of creation: "It is very good". One need only think of such figures as St Benedict, St Francis of Assisi, St Teresa of Avila, St Ignatius of Loyola, St Charles Borromeo, the founders of 19-century religious orders who inspired and guided the social movement, or the saints of our own day - Maximilian Kolbe, Edith Stein, Mother Teresa, Padre Pio. In contemplating these figures we learn what it means "to adore" and what it means to live according to the measure of the Child of Bethlehem, by the measure of Jesus Christ and of God himself. The saints, as we said, are the true reformers. Now I want to express this in an even more radical way: only from the saints, only from God does true revolution come, the definitive way to change the world. In the last century we experienced revolutions with a common programme - expecting nothing more from God, they assumed total responsibility for the cause of the world in order to change it. And this, as we saw, meant that a human and partial point of view was always taken as an absolute guiding principle. Absolutizing what is not absolute but relative is called totalitarianism. It does not liberate man, but takes away his dignity and enslaves him. Dear friends! Allow me to add just two brief thoughts. There are many who speak of God; some even preach hatred and perpetrate violence in God's Name. So it is important to discover the true face of God. The Magi from the East found it when they knelt down before the Child of Bethlehem. "Anyone who has seen me has seen the Father", said Jesus to Philip (Jn 14: 9). In Jesus Christ, who allowed his heart to be pierced for us, the true face of God is seen. We will follow him together with the great multitude of those who went before us. Then we will be travelling along the right path. This means that we are not constructing a private God, we are not constructing a private Jesus, but that we believe and worship the Jesus who is manifested to us by the Sacred Scriptures and who reveals himself to be alive in the great procession of the faithful called the Church, always alongside us and always before us. There is much that could be criticized in the Church. We know this and the Lord himself told us so: it is a net with good fish and bad fish, a field with wheat and darnel. Pope John Paul II, as well as revealing the true face of the Church in the many saints that he canonized, also asked pardon for the wrong that was done in the course of history through the words and deeds of members of the Church. In this way he showed us our own true image and urged us to take our place, with all our faults and weaknesses, in the procession of the saints that began with the Magi from the East. It is actually consoling to realize that there is darnel in the Church. In this way, despite all our defects, we can still hope to be counted among the disciples of Jesus, who came to call sinners. The Church is like a human family, but at the same time it is also the great family of God, through which he establishes an overarching communion and unity that embraces every continent, culture and nation. So we are glad to belong to this great family that we see here; we are glad to have brothers and friends all over the world. Here in Cologne we discover the joy of belonging to a family as vast as the world, including Heaven and earth, the past, the present, the future and every part of the earth. In this great band of pilgrims we walk side by side with Christ, we walk with the star that enlightens our history. "Going into the house, they saw the child with Mary his mother, and they fell down and worshipped him" (Mt 2: 11). Dear friends, this is not a distant story that took place long ago. It is with us now. Here in the Sacred Host he is present before us and in our midst. As at that time, so now he is mysteriously veiled in a sacred silence; as at that time, it is here that the true face of God is revealed. For us he became a grain of wheat that falls on the ground and dies and bears fruit until the end of the world (cf. Jn 12: 24). He is present now as he was then in Bethlehem. He invites us to that inner pilgrimage which is called adoration. Let us set off on this pilgrimage of the spirit and let us ask him to be our guide. Amen. "Apart from the cross, there is no other ladder by which we may get to heaven" -- St. Rosa de Lima. Today the Church remembers St. Bernard of Clairvaux (1090-1153), abbot and Doctor of the Church, who was canonized, 21 years after his death. He is referred to as the second founder of the Cistercians, the Mellifluous Doctor, the Apostle of the Crusades, the miracle-worker, the reconciler of kings, the leader of peoples, and the counselor of popes. In 1830, he was given the title of Doctor of the Church by Pope Pius VIII. He was born in 1090, the third son of a noble Burgundian family. At an early age he was sent to college at Chatillon. He studied Holy Scripture and Theology. St. Bernard, at the age of 22, entered the monastery of Citeaux (where the Cistercian order began) following the death of his mother and fearing the ways of the world. He convinced 25 other youths in the noble class as well as four his brothers to follow him. His father and a fifth brother later followed. St. Stephen, the abbot at Citeaux, after seeing the great progress of Bernard in the spiritual life, sent him with twelve monks to found a new monastery. 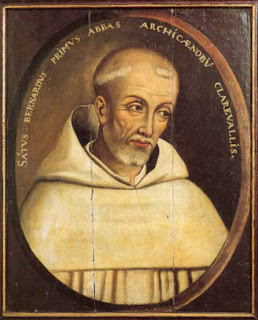 St. Bernard would found the famous Abbey of Clairvaux. St. Bernard became abbot in 1115; he founded numerous other monasteries too. St. Bernard dedicated his work, De Consideratione, to his disciple, Bernard of Pisa, who later became Pope Eugene III. Pope Eugene III later asked St. Bernard to preach the second Crusade, so St. Bernard traveled France and Germany preaching. After the failure of the crusade, some people turned on St. Bernard. St. Bernard countered by saying that the knights failed because of their sinfulness. St. Bernard's influence on the princes, clergy, and people of his time was remarkable. He was an advisor to King Louis the Fat and King Louis the Young. St. Bernard attended the Second Lateran Council and both fought Albigensianism and helped to end the schism of anti-Pope Anacletus II. He was also endowed with the gift of miracles. He died on August 20, 1153. St. Bernard was the first Cistercian monk placed on the calendar of saints. O God, Who didst give blessed Bernard to Thy people as a minister of eternal salvation: grant, we beseech Thee, that we, who have had him for our teacher on earth, may deserve to have him for our advocate in heaven. Through our Lord. 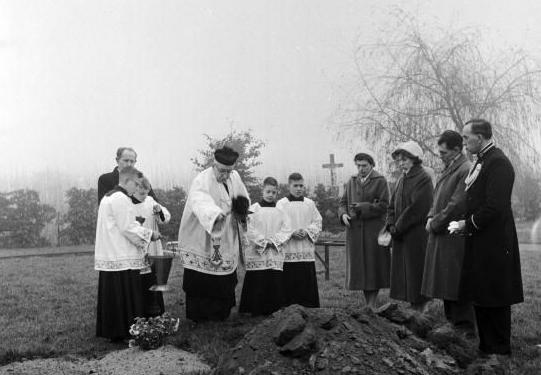 Why have a Mass for a Deceased Loved One? Can you pray for the dead? What is the Mass? And why is it valuable? Can we pray for the dead? And if so, why? And finally, if we can pray for the dead, is the Mass the greatest prayer we can make for them? Q: Can you really pray for the dead? What is the basis for this? Q: What is the Mass? Mass is the Sacrifice of Christ on the Cross and for that reason, it is by definition efficacious. We are present at Calvary. Rather than merely remembering the life and death of Christ, we are present at it and partake of its eternal fruits which flow to us from the altar when the priest stands in the place of Christ and offers the Eternal Victim on the altar to God. We can further receive grace by partaking of the Holy Eucharist, if we are Catholics in the state of grace. Q: What is the value of the Mass? “The Holy Mass is the renewal of the sacrifice of the Cross”. It is the sacrifice that detains Divine justice, that rules the entire Church, that saves the world. In the hour of death, the Masses that you have devoutly attended will be your greatest consolation. In each Mass the temporal suffering due to your sins is diminished in accordance with the degree of commitment you bring to it. In each Mass, Jesus forgives you the venial sins you have not confessed but have repented. In each Mass, Satan’s dominion over you is reduced. One Mass heard by you in your life does more good than many that may be heard for you after your death. In each Mass, you are given protection against dangers and misfortunes that would otherwise have befallen you. With each Mass your time in Purgatory is reduced. 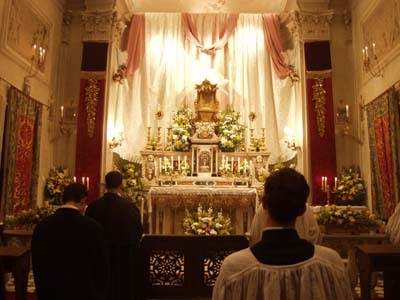 The Holy Sacrifice is the most effective of prayers, over and above all other prayers, good works and penance; by its own virtue it immediately and infallibly produces effect in favour of souls. 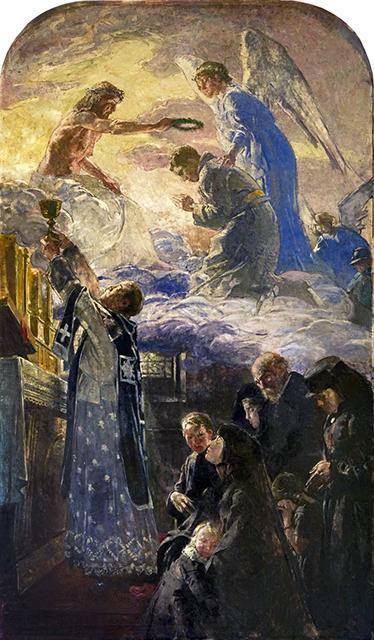 Each Mass procures for you a higher grade of glory in Heaven. And you are blessed also in your personal affairs and interests. “If we only knew the worth of the Holy Sacrifice of the Mass,with how much greater zeal we would listen it” (the Holy Cure of Ars). 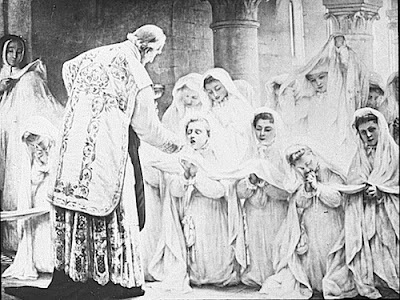 “It is worth more to hear a single Mass that to distribute all your riches among the poor and to make pilgrimage throughout the whole earth” (St. Bernard). “The Lord grants us all we ask of him in the Holy Mass, and what’s more, He grants us even what we do not think of asking but which we also need!" (St Girolamo). So to summarize, we wish to make clear that the Mass truly is the Sacrifice of Christ on the Cross. A: Just as we pray for others here on earth, we are encouraged by the Church to pray for souls who may be in purgatory. Why? We are all in need of grace to come into the perfection of charity. We cannot enter heaven if we have not been completely cleansed of sin and all punishment due to sin. Since the Mass is the "source and summit" of the Christian Life, we naturally look to that Holy Sacrifice of Christ, containing the perfect prayer, to offer for our deceased relatives and friends who may still need the help of our prayers. Priests are under a strict obligation to remember in a special way the person for whom the Mass is being offered. Often you will hear the priests say the name of the person in the part of the Mass which specifically remembers those who have gone before us. Sometimes the intention for the Mass is listed in the bulletin or announced before the Mass. We can't really speak of "time" since the deceased person has entered eternity, but we can speak in terms of "final purification" before entrance into heaven. We believe that a Mass offered for a departed relative or friend may help hasten that final purification which he/she may still be undergoing in purgatory. So yes, a Mass does help lessen the soul's time in purgatory. And since the Mass truly is the Sacrifice of Jesus on the Cross, it is the most perfect prayer and sacrifice. As such, there is nothing more glorious that we can offer to God on behalf of souls. Q: How exactly can I have a Mass said for the repose of the soul of a friend/relative? A: Ask a priest to offer a Mass for the intention of the repose of the soul of your friend/relative. I also highly encourage having Gregorian Masses said for the repose of the deceased. These pious practices are truly worthwhile. More information on Gregorian Masses, and how to have one offered, are available at the website of the Friends of the Suffering Souls. Also, see the Regina Caeli Purgatorial Society and enroll as many souls as you would like. There is no cost. Q. What Indulged Prayers May I Offer for the Benefit of my love one's soul? For a listing of hundreds of prayers with indulgences and special blessings attached to them, be sure to refer to a copy of the Raccolta often. Click here to order one. And for a list of other private works that you can do for the souls of the dead in purgatory (e.g. heroic acts of charity, fasting, etc) please click here. I cordially thank you and am very pleased to have this meeting. I had asked - and this has already been said - that the programme of these days in Cologne should include a special meeting with young seminarians, so that the vocational dimension would truly emerge in all of its importance, since it plays an evermore important role in the World Youth Days. It seems to be that the rain too that is falling down from heaven is a blessing. I can imagine the echo that resounds in your hearts from the words of the theme of this 20th World Youth Day - "We have come to worship him" - and the entire moving narration of the searching and finding of the Wise Men. Each in his own way - we consider the three witnesses we have just heard - like them, they see a star, set out on their journey, they too must face what is unclear and are able to arrive at their destination under God's guidance. This evangelical passage of the Wise Men who search out and find Jesus has a special meaning precisely for you, dear seminarians, because you are on an authentic journey, engaged in discerning - and this is a true journey - and confirming your call to the priesthood. Let us pause and reflect on this theme. Why did the Magi set off from afar to go to Bethlehem? The answer has to do with the mystery of the "star" which they saw "in the East" and which they recognized as the star of the "King of the Jews", that is to say, the sign of the birth of the Messiah (cf. Mt 2: 2). So their journey was inspired by a powerful hope, strengthened and guided by the star, which led them towards the King of the Jews, towards the kingship of God himself. This is the meaning behind our journey: to serve the kingship of God in the world. Dear friends, this is the mystery of God's call, the mystery of vocation. It is part of the life of every Christian, but it is particularly evident in those whom Christ asks to leave everything in order to follow him more closely. The seminarian experiences the beauty of that call in a moment of grace which could be defined as "falling in love". His soul is filled with amazement, which makes him ask in prayer: "Lord, why me?". But love knows no "why"; it is a free gift to which one responds with the gift of self. The seminary years are a time of journeying, of exploration, but above all of discovering Christ. It is only when a young man has had a personal experience of Christ that he can truly understand the Lord's will and consequently his own vocation. The better you know Jesus the more his mystery attracts you. The more you discover him, the more you are moved to seek him. This is a movement of the Spirit which lasts throughout life, and which makes the seminary a time of immense promise, a true "springtime". When the Magi came to Bethlehem, "going into the house they saw the child with Mary his mother, and they fell down and worshiped him" (Mt 2: 11). Here at last was the long-awaited moment: their encounter with Jesus. "Going into the house": this house in some sense represents the Church. In order to find the Saviour, one has to enter the house, which is the Church. During his time in the seminary, a particularly important process of maturation takes place in the consciousness of the young seminarian: he no longer sees the Church "from the outside", but rather, as it were, "from the inside", and he comes to sense that she is his "home", inasmuch as she is the home of Christ, where "Mary his mother" dwells. "They fell down and worshiped him... and offered him gifts: gold, frankincense and myrrh" (Mt 2: 11-12). Here is the culmination of the whole journey: encounter becomes adoration; it blossoms into an act of faith and love which acknowledges in Jesus, born of Mary, the Son of God made man. How can we fail to see prefigured in this gesture of the Magi the faith of Simon Peter and of the other Apostles, the faith of Paul and of all the saints, particularly of the many saintly seminarians and priests who have graced the 2,000 years of the Church's history? The secret of holiness is friendship with Christ and faithful obedience to his will. St Ambrose said: "Christ is everything for us"; and St Benedict warned against putting anything before the love of Christ. The seminary years are a time of preparing for mission. The Magi "departed for their own country" and most certainly bore witness to their encounter with the King of the Jews. Dear seminarians! One day, God willing, by the consecration of the Holy Spirit you too will begin your mission. Remember always the words of Jesus: "Abide in my love" (Jn 15: 9). If you abide close to Christ, with Christ and in Christ, you will bear much fruit, just as he promised. 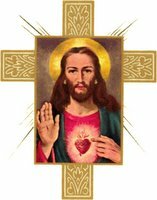 You have not chosen him - we have just heard this in the witnesses given -, he has chosen you (cf. Jn 15: 16). Here is the secret of your vocation and your mission! It is kept in the Immaculate Heart of Mary, who watches over each one of you with a mother's love. Have recourse to Mary, often and with confidence. I was thinking of starting a weekly project, where we can all talk about a certain saint for that week. I could put up a poll for what saint, and when we have a saint we can talk about their life and debate on their signfigance to the Church. We also can look at devotions to them. I could even learn a lot. Would anyone here like to participate in this? Those words of St. Therese are found through doing the little things in life - like putting a bumper sticker on your car: "Abortion stops a beating heart". I just read on the blog, Open Wide the Doors to Christ, about a woman that changed her mind on having an abortion just by reading one of those bumper stickers. What a great story of how the little things can be great! I found a prayer online called the "Litany of Humility" and it can be read by following the link in the title. Humility is indeed a rare virtue so I felt it wise to share a special prayer for humility. The Beatitudes even mention the grace of being meek and humble. Blessed are the poor in spirit: for theirs is the kingdom of heaven. Blessed are the meek: for they shall possess the land. Blessed are they that mourn: for they shall be comforted. Blessed are they that hunger and thirst after justice: for they shall have their fill. Blessed are the merciful: for they shall obtain mercy. Blessed are the clean of heart: for they shall see God. Blessed are the peacemakers: for they shall be called children of God. Blessed are they that suffer persecution for justice' sake: for theirs is the kingdom of heaven. Blessed are ye when they shall revile you, and persecute you, and speak all that is evil against you, untruly, for my sake: Be glad and rejoice, for your reward is very great in heaven. For so they persecuted the prophets that were before you. Pope Benedict XVI is in Cologne, Germany right now for World Youth Day and can be watched on EWTN. His opening address (in several languages) was very enlightening and welcoming especially the ending where He stated that by inviting Christ into our life we lose nothing but rather Christ will then bring all things in us to perfection. The following is his address from the River Rhine. Dear young people, the happiness you are seeking, the happiness you have a right to enjoy has a name and a face: it is Jesus of Nazareth, hidden in the Eucharist. Only he gives the fullness of life to humanity! With Mary, say your own "yes" to God, for he wishes to give himself to you. I repeat today what I said at the beginning of my Pontificate: "If we let Christ into our lives, we lose nothing, nothing, absolutely nothing of what makes life free, beautiful and great. No! Only in this friendship are the doors of life opened wide. Only in this friendship is the great potential of human existence truly revealed. Only in this friendship do we experience beauty and liberation" (Homily at the Mass of Inauguration, 24 April 2005). Be completely convinced of this: Christ takes from you nothing that is beautiful and great, but brings everything to perfection for the glory of God, the happiness of men and women, and the salvation of the world. In these days I encourage you to commit yourselves without reserve to serving Christ, whatever the cost. The encounter with Jesus Christ will allow you to experience in your hearts the joy of his living and life-giving presence, and enable you to bear witness to it before others. Let your presence in this city be the first sign and proclamation of the Gospel, thanks to the witness of your actions and your joy. Let us raise our hearts in a hymn of praise and thanksgiving to the Father for the many blessings he has given us and for the gift of faith which we will celebrate together, making it manifest to the world from this land in the heart of Europe, a Europe which owes so much to the Gospel and its witnesses down the centuries. And now I shall go as a pilgrim to the Cathedral of Cologne, to venerate the relics of the holy Magi who left everything to follow the star which was guiding them to the Saviour of the human race. You too, dear young people, have already had, or will have, the opportunity to make the same pilgrimage. Later in the day, the Holy Father visited the Cathedral in Rome and prayed before the relics of the Magi. Read his address there. Before Jesus was scourged in the film "The Passion of the Christ", He said, looking to Heaven: "My heart is ready" yet the pain afterward was so tremendous few people could probably watch. I found an excellent article on this over on Catholic Exchange. 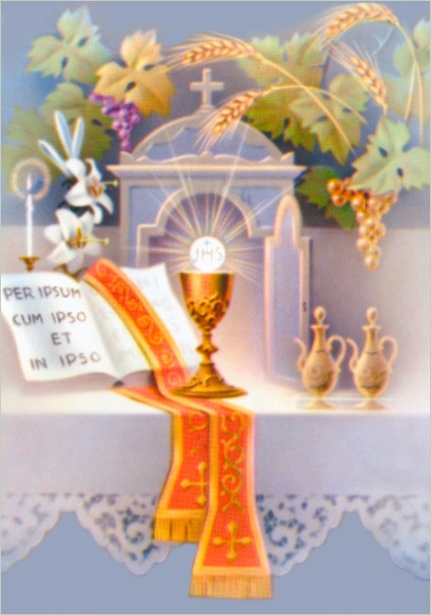 The Holy Eucharist is not just a symbol of God but actually is Jesus Christ's body, blood, soul, and divinity. The Eucharist is God! For more information on the Eucharist, see my page on the Eucharist. Yes, God is always with us in life, but He is with us differently in different places. 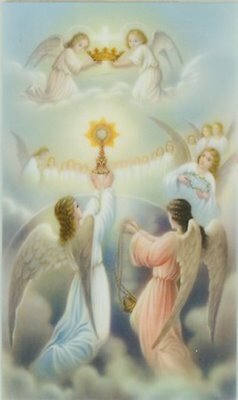 In the Eucharist, Jesus Christ is truly there - Body, Blood, Soul, and Divinity! At no other moment can we get closer to Heaven in this life than we receive and adore Our Savior. I can pray in my home, but I can not pray truly before Jesus like I can in the Eucharist. done by many volunteer parishioners; in a monastery or convent, it is done by the resident monks or nuns. 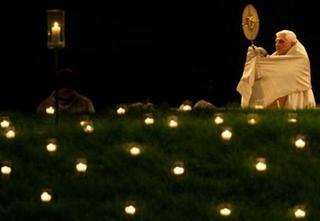 The best website I can find on Eucharistic adoration is The Real Presence. I especially like the idea there by Fr. John A. Hardon, S.J. to spend a holy hour in four quarters: Adoration, Thanksgiving, Reparation, and giving something to God. 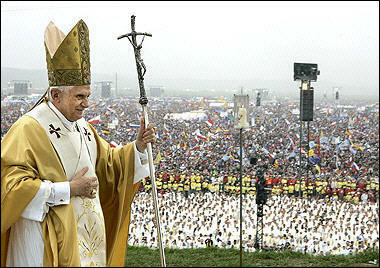 Today World Youth Day opens and marks the 10th annual gathering of youth. This is an event that began under Pope John Paul ll and attempts to bring youth together, although it seems to be just another WoodStock and not in any manner an authentically Catholic retreat. I do not support World Youth Days for the debauchery, immodesty, and sacrilege which have come from these events. So far there have been 405,000 registered individuals comprised of 101,174 Italians, 38,549 French, 31,908 Spanish and 24,237 Americans with 191 countries and territories being represented. Now, some claim that World Youth Day attracted only those wishing to see Pope John Paul ll as a celebrity and not a religious leader, and there are no statistics available to how it helped increase the number of Catholics. Also, I'm following it through a blog I found by a priest attending World Youth Day. Visit the blog, Coragio, to see more, though I do not necessarily endorse any views expressed on that website. One very easy way to remember Our Lord's love and mercy is to either wear a crucifix or place one on our walls, typically above the bed. It is also important that we should wear a crucifix (a cross with Christ's body on it) instead of a Cross because it is through Jesus' Cross that we reach the Resurrection. Let us not forget Our Lord's sacrifice. Some claim that since Jesus is resurrected He should not be on the cross, but if you look at it that way then we should show an empty tomb not an empty cross. If there was an empty cross then this would be our faith - eternal death, the price of sin (Romans 5:12). But Jesus Christ, true Man and true God, chose to pay the price for us (1 Cor 15:3) and died for us even when He did not have to do anything of the such. Jesus never had to enter the Virgin's womb, but He chose to do it so that we might have eternal life with Him. An empty cross for each of us was our destiny, but God chose to free us from the penalty of sin that we willing deserved. 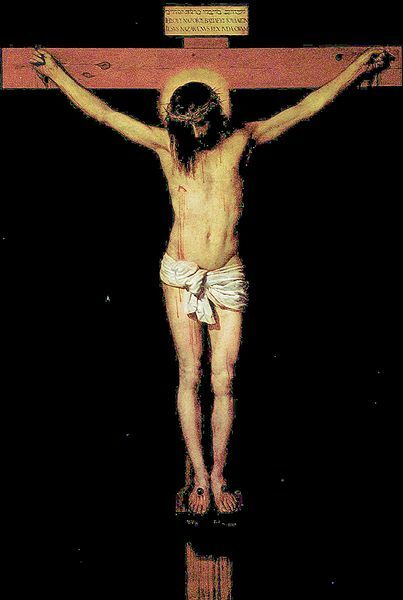 Every time we sin we will have only caused Our Lord greater pain on His Cross, so let us remember His sacrifice today, especially in the sorrowful mysteries of the Rosary, and thank Him for pardoning us for the sins we willingly commit. It was Our Lord, Jesus Christ, that prepared the way for us, and we too must follow Him believing that if we die with Him we shall also rise with Him. "Whoever does not carry the cross and follow me is not worthy of me" (Matthew 10:38). Today is the Solemnity of the Assumption of the Blessed Virgin Mary, where we profess our belief in the Dogma that Mary was assumed into Heaven body and soul by the power of God. This is a Dogma of the faith and must be believed to be Catholic; it has been taught since the early Church to the present day with allusions in the Sacred Scriptures. The Eastern Churches (which are still in union with Rome) refer to today as the Dormition as opposed to the Assumption because they believe that Mary died and was then assumed into Heaven. As Roman Catholics in the Latin Rite, we are free to believe that Mary died and then was assumed into Heaven or that she didn't die but right before her death she was assumed into Heaven. Some claim that the Assumption never happened because it is not in the Scriptures, but remember that the Bible deals with God not Mary. The Bible does not deal with the earthy end of any of the original disciples after the Gospel ends. Remember, today is a Holy Day of Obligation, meaning all Catholics must attend Mass. Please pray for the Souls in Purgatory today. 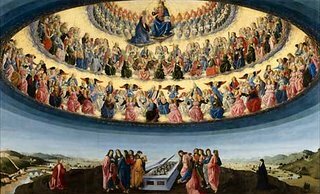 It is written that at the time of Mary’s Assumption, all of purgatory was emptied, and the souls detained there accompanied her in her triumphant entry into Heaven. St. Bernardine of Siena also states that through her prayers and the application of her own merits, the Virgin has the power of freeing souls, especially her devotees, from purgatory. 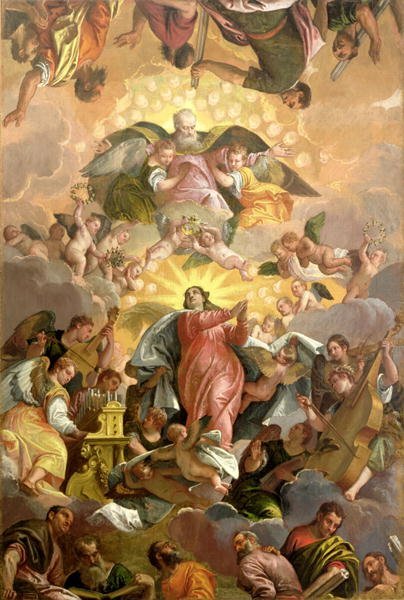 St. Peter Damian attests that every year on the Feast of the Assumption (August 15), the Virgin liberates thousands of souls. "God’s temple in heaven was opened, and the ark of his covenant could be seen in the temple. A great sign appeared in the sky, a woman clothed with the sun, with the moon under her feet, and on her head a crown of twelve stars. She was with child and wailed aloud in pain as she labored to give birth. "Then another sign appeared in the sky; it was a huge red dragon, with seven heads and ten horns, and on its heads were seven diadems. Its tail swept away a third of the stars in the sky and hurled them down to the earth. Then the dragon stood before the woman about to give birth, to devour her child when she gave birth. She gave birth to a son, a male child, destined to rule all the nations with an iron rod. Her child was caught up to God and his throne. The woman herself fled into the desert where she had a place prepared by God." The Christian people have never ceased to invoke and experience the Blessed Virgin Mary's assistance, and therefore they have, at all times, venerated her with ever growing devotion. And so, because love when it is true and deeply felt tends of its own nature to manifest itself through ever renewed demonstrations, the faithful have vied with one another all through the centuries in expressing at all times their ardent piety toward the Queen of Heaven. In our opinion, this is the reason why, for a long time past, numerous petitions (those received from 1849 to 1940 have been gathered in two volumes which, accompanied with suitable comments, have been recently printed), from cardinals, patriarchs, archbishops, bishops, priests, religious of both sexes, associations, universities and innumerable private persons have reached the Holy See, all begging that the bodily Assumption into heaven of the Blessed Virgin should be defined and proclaimed as a dogma of faith. And certainly no one is unaware of the fact that this was fervently requested by almost two hundred fathers in the Vatican Council. Almighty and everlasting God, Who hast taken body and soul into heaven the Immaculate Virgin Mary, Mother of Thy Son: grant, we beseech Thee, that by steadfastly keeping heaven as our goal we may be counted worthy to join her in glory. Through the same our Lord. If you are interested in learning more about the Assumption of the Blessed Virgin Mary please consider purchasing the applicable lesson from CatechismClass.com, which is available for only a few dollars.